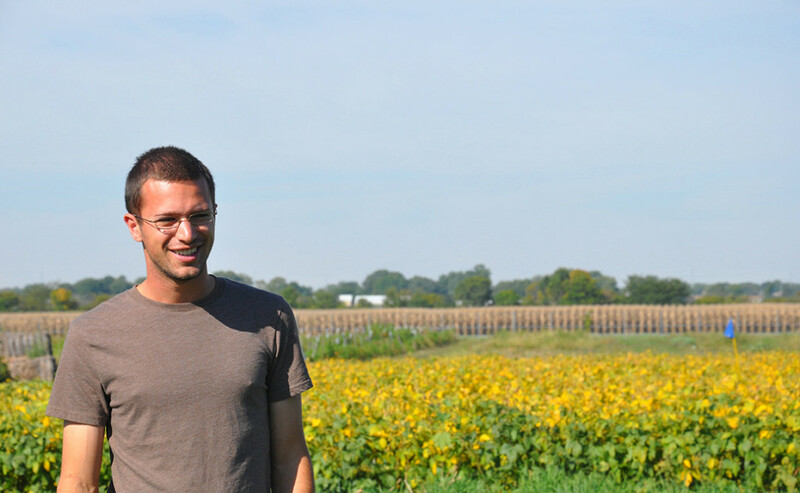 Kevin Wolz wants to redefine agriculture in the Midwest. A PhD student at the University of Illinois at Urbana-Champaign, Wolz is working with fellow students and professors to design a system that would return the landscape to trees, shrubs and grasses while still preserving the region’s status as an agricultural powerhouse. And his results have already caught the eye of farmers and fellow researchers. The project began in 2012 on a five-acre research field just south of the University of Illinois, the first of its kind in the country. Half the site mimics corn and soybean fields. But that iconic scene is interrupted by thick groupings of woody perennial plants modeled after an oak savanna, the ecosystem that once dominated central Illinois. The crucial crops in the polyculture system are chestnuts and hazelnuts. These plants have the same nutritional profiles—the breakdown of carbohydrates, proteins and oils—as corn and soybeans, making them largely interchangeable in an industrial food system. “The only real difference would be that your bag of chips would say ‘made with high-fructose chestnut syrup,’” Wolz added. The researchers have monitored water use, soil health, nutrient loss and biodiversity in the two crop systems since the first season. And, for the most part, the results match what they expected from a transition to woody perennials. Because perennials have a longer growing season, the savanna-based system requires more water in a year than the nearby rows of corn and soybean. A large portion of the water used by trees and shrubs, though, is taken in early spring and fall, when droughts are rare. And their deeper roots allow them to find water even when the surface of the soil is dry. Differences in growing seasons and root structures may also explain the sharp decrease in nitrate-nitrogen losses observed in the polyculture rows. Compared to corn and soybeans, the woody perennial crops captured 5–10 times more nitrate in their second year—adding up to a roughly 80 percent reduction in nitrogen losses. The speed and magnitude of the results made it possible for the researchers to expand their efforts to a 40-acre plot roughly a quarter mile down the road. Planting was completed in spring 2015. The larger site, Wolz said, will allow them to answer more complex questions about the impacts of woody perennial polyculture on local hydrology, water quality and greenhouse emissions. And by mixing and matching the makeup of plants, the team hopes to pin down how competition for water, light and other resources influences crop performance and yield. At the same time, a case study program spearheaded by the Savanna Institute—a research and outreach non-profit founded by Wolz in 2013—is offering insight into the economic viability of the new agricultural system. Sixteen farms throughout the Midwest planted more than 70,000 trees, shrubs and vines in the program’s first two years.